I decided to do a makeover one of our bedrooms. This bedroom was my son’s while he was growing up, and now it’s the room that our granddaughter sleeps in when she stays with us. It was pretty blah and boring to start with. We already had the furniture and some of the bedding, and we also had a headboard stored in a closet that I could use for the room. I painted the room a couple of years ago during our renovation. It’s a nice neutral that goes with everything, so it stayed. Some of the things that I knew I wanted to add to the room were a dust ruffle, window treatments, wall art, pillows and accessories. I also knew that I wanted to paint the bedroom furniture, including the headboard. A big wish list, and not a lot of money to do it with! My inspiration for the room was a pillow that I made a couple of years ago. 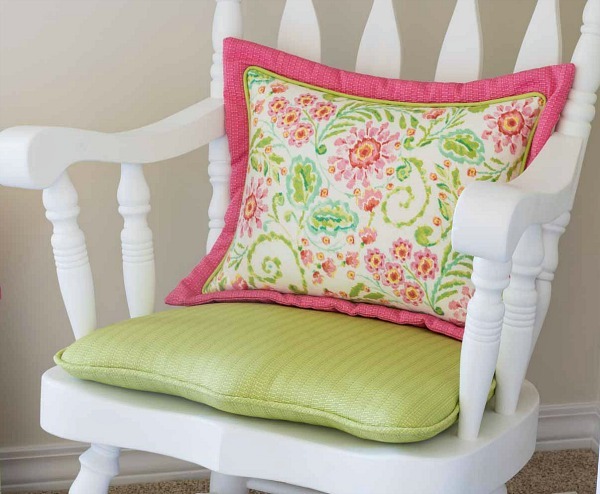 My grand daughter loves this pillow, so it was a great starting point for the makeover. Luckily, I had some scraps of fabric left, and some that coordinated with it in my fabric stash. 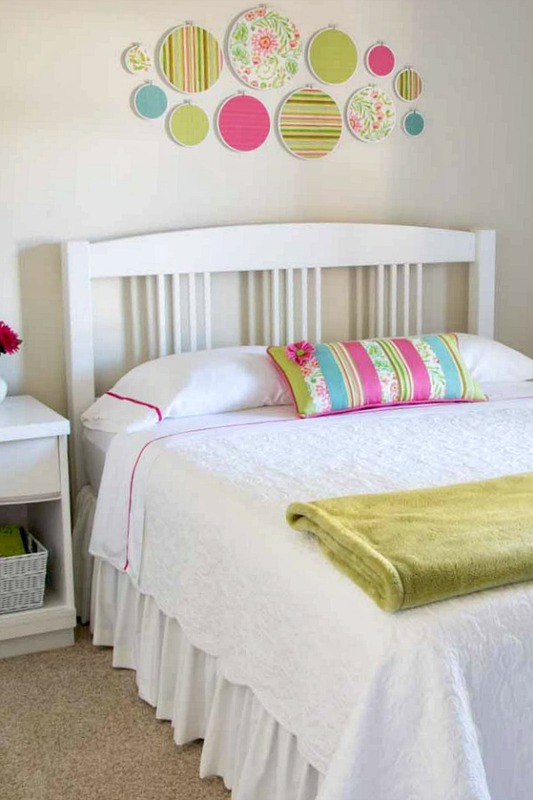 This bedroom has gone from blah and boring to bright and fun! 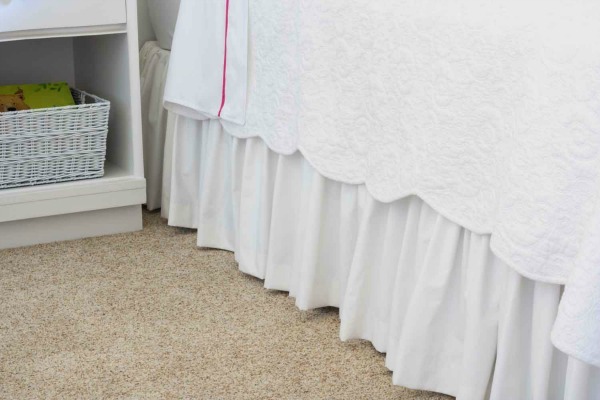 My biggest expense for the room was the Ikea drapery panels that are under the valance. I had a leftover panel from when I made our living room valances, so I was able to use it for the pleated valance. 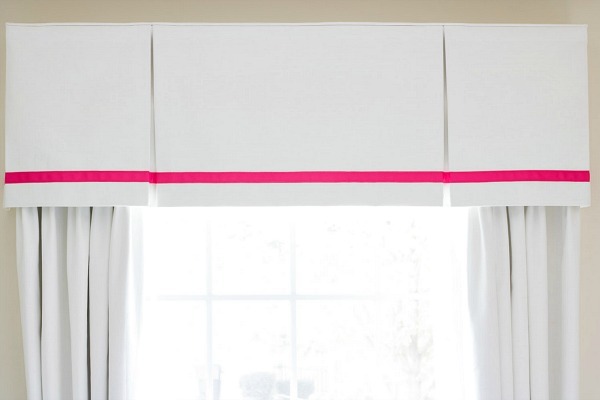 The inexpensive pink ribbon really added a pop of color! 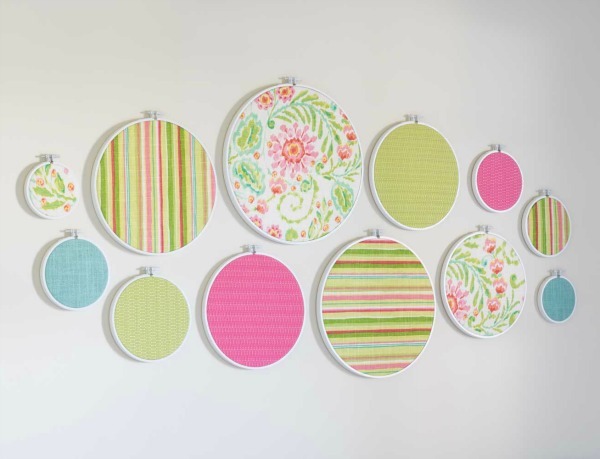 The wall art above the bed I made out of scraps of fabric and embroidery hoops that I painted white. 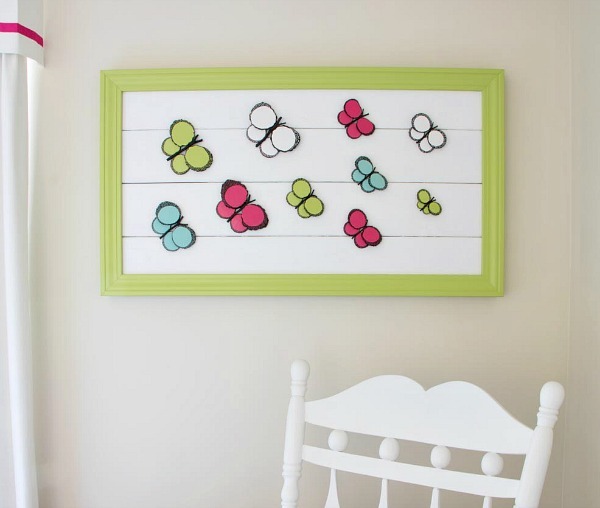 The butterfly wall art is almost all re-purposed things I already had. The wings for the butterflies are slices of tree limbs, and the background is made from our old deck boards. I even made the frame (my first attempt at mitered corners) out of leftover trim and boards we had in the garage. The only thing I had to buy was the pink craft paint for the pink butterflies, I had all of the other paints. 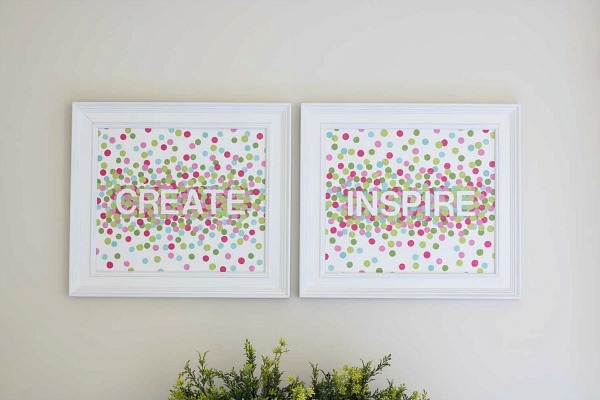 The Create and Inspire pictures were made from things I already had, except for the foam pouncer I used to create the painted dots. 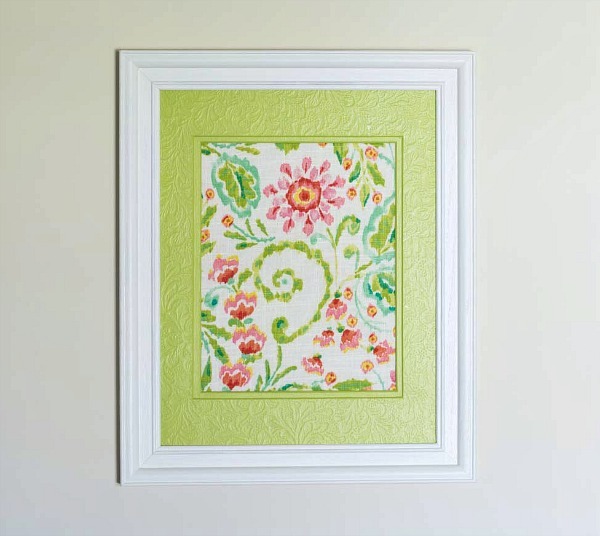 The last piece I made for the walls was made with a scrap of fabric and a frame and mat that I painted. I made the dust ruffle out of leftover blackout lining. I sewed inexpensive ribbon to the white sheets we had, and made a cute pillow out of the fabric scraps. The only accessory that I bought was the flowers for the dresser and nightstand. 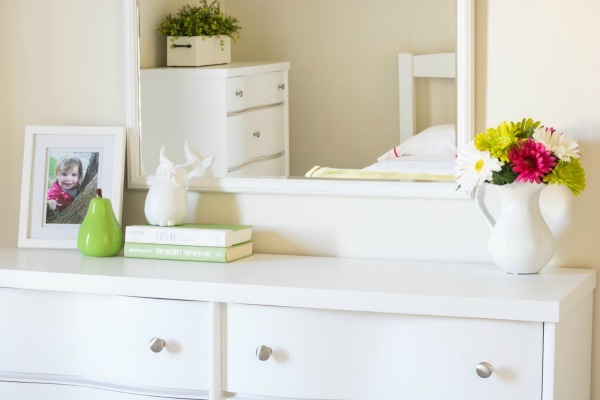 The biggest change I made to the room was painting all of the furniture white. I love how bright the room is now! I had the paint leftover from other painting projects. The knobs I already had too. I bought a ton of knobs when we did our home renovation a couple of years ago, and I was going to use these on the set of furniture in our bedroom. I decided to go with black knobs and handles in our bedroom instead, so I had these to use in this room. You can find the tutorial in my How To Paint Furniture post. For a grand total of $97.47! 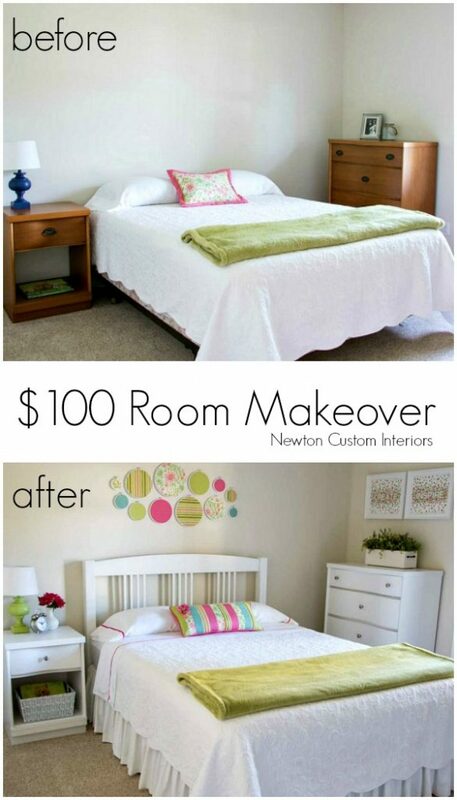 I hope you’ve enjoyed this tour of our $100 room makeover! Stay tuned for step-by-step tutorials for many of the projects made for the room. 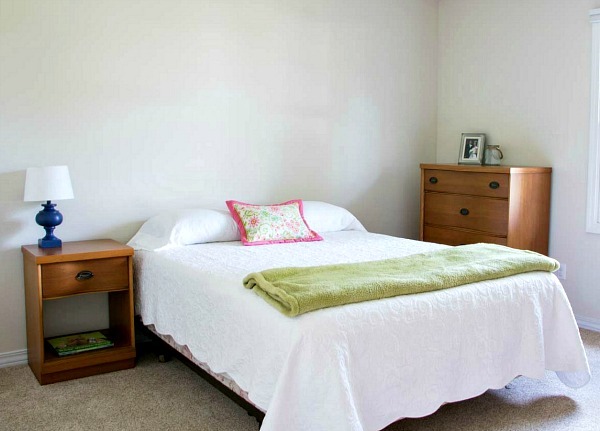 To see more of our room renovations, check out our Home Tour page! « My Design Aesthethic May Not Be Yours…But That’s OK! I absolutely love all the wall art you created for this room! It’s so bright and cheerful, and all look like something you would spend a ton of money for at the store! 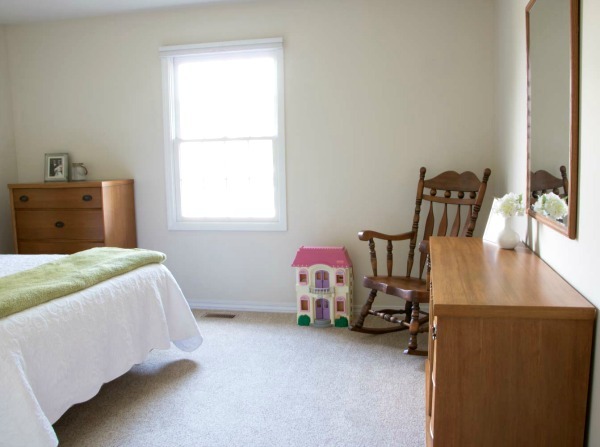 I’m sure your granddaughter will love staying in this room. Jann, will you come live at my house? Seriously, what a transformation, I just love all the color and the little details you added, and so thriftily too! 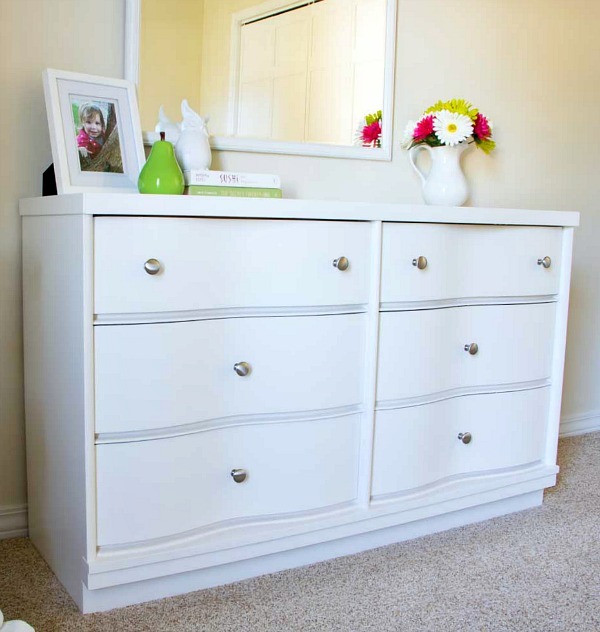 Your granddaughter is a lucky little girl 🙂 The furniture is beautiful in white, I wonder what my husband will say when I tell him I want to paint ours, uh, he won’t agree but I’ll keep working on him. I love how you use color throughout your home. It is so refreshing. Jann….what a beautiful room makeover. 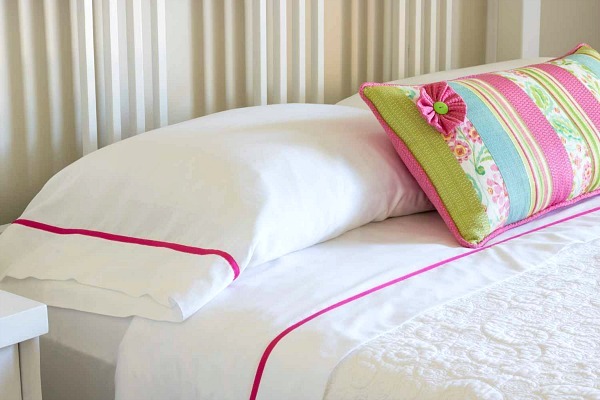 I love your color choices… the greens and pinks just pop off of the whites in the room. Very nice job and all the details are just perfect. Looks great! She will love it! Jann I love how bright and airy your room looks now!!! That rocking chair was my favorite transformation! Nice job!!! Thanks Janice! The rocking chair is one of my favorite changes too! You are so talented!! Seriously talented. I have always admired your eye for color and pattern and it shows in this room. Great job! Wow!! What a transformation.. I just love what you have done with the space. 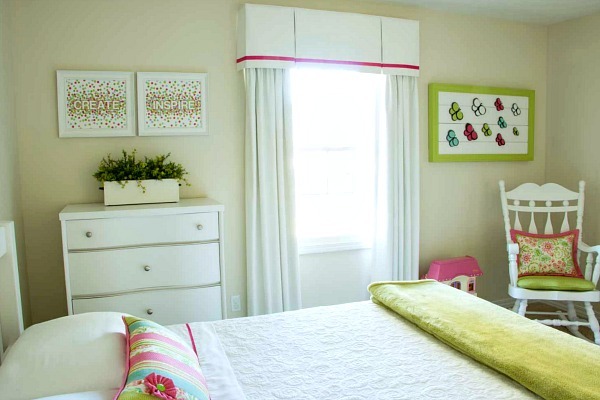 I am a big fan of color and I love how you bring in pops of color to make it so lively and yet not overwhelming! Great transformation! Love the hoops over the bead. It’s amazing what painting furniture can do for a room. Visiting from BOB Tribe. Once again I am loving the color in your decorating! So bright and fresh! Great Job Jann! A big wow to this fabulous makeover Jann! Love it! You did such a great job and all for under $100! Thanks Maria! It was a fun project to work on, and my granddaughter loves it!